I don’t know about you, but I tend to find most store bought decorations for Independence day a little…well, over the top and overly starry and stripy. Don’t get me wrong – I love America and our patterned flag of freedom, I just don’t want to necessarily use it as my table cloth when entertaining guests. This summer I was able to come up with a few well-designed solutions for HGTV.com and make a huge (toot toot) blast for my love of ombré. A trend that I have previously declared amazing even in noodle form. By dip dying fabrics you’re making a bold and graphic statement while keeping the table top modern with those hits of red, white and blue. Throw in some Campari sodas, not-quite-but-kinda-star-spangled straws, a large pom pom of white flowers and you’re ready to have one of the prettiest little patriotic tables in town. Get your D to the IY on and make a dip dye statement of your own! Elote (Mexican Corn) is anything but uncommon here in Los Angeles. This street vendor street treat is a southern California staple and something that I always include with my summer-timing ‘que menu. 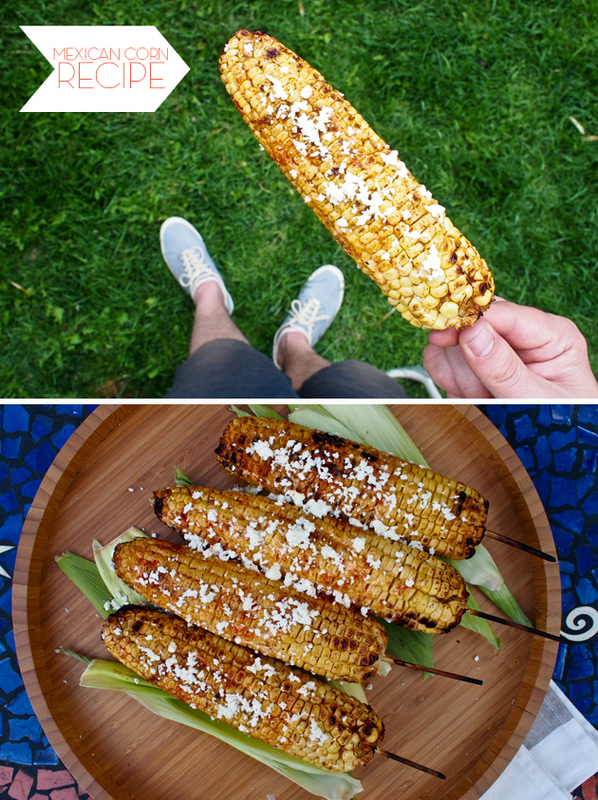 It doesn’t matter if your grilling steak, chicken or just flipping some burgers, this corn is spicy salty perfection. Hostess Tip: Flip this snack on the quick for any vegan visitors by using soy based mayo and mock feta crumbles. Olé! It’s a face-melting 99 degrees already around these parts which means a big N to the heck NO when it comes to turning on the oven. Take that heat outside and fire up the grill like a hero. While you’re at it, take full advantage of Avocado season being in full swing. This gazpacho is a favorite, infused with spicy cucumber and pepper water and topped with cumin shrimp. Perfection. Speaking of – when’s the last time you threw some fruit on the barbie? I suggest this be a summer of new beginnings and just throw your carefree hands in the air now. Do not resist. It is going to happen and it is going to get crazy delicious. 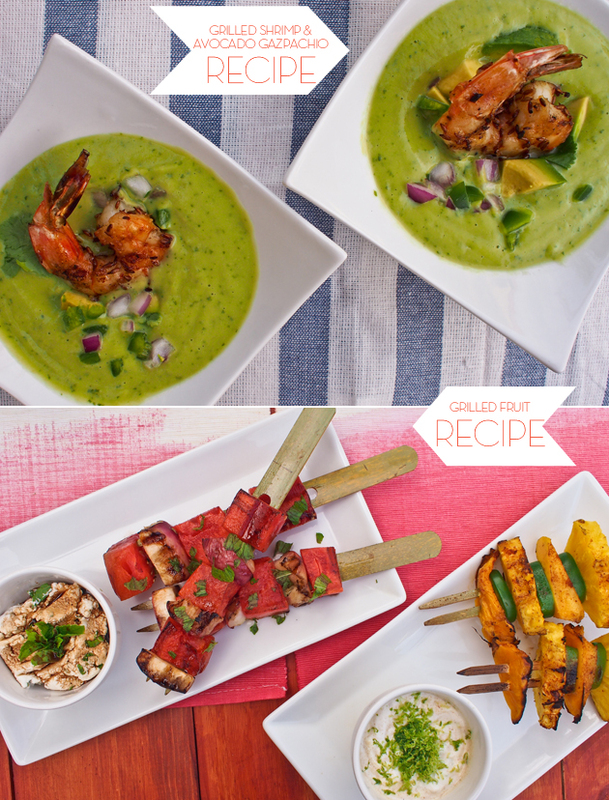 Check out these Grilled Cumin Shrimp Avocado Gazpacho & Grilled Fruit Skewer Recipes! One thing I miss living in LA is not being able to set off my own personal fireworks display at the end of the driveway. Can’t this Midwestern gal just get one Black Snake up in here to kick off the patriot spirit of the holiday!? No? 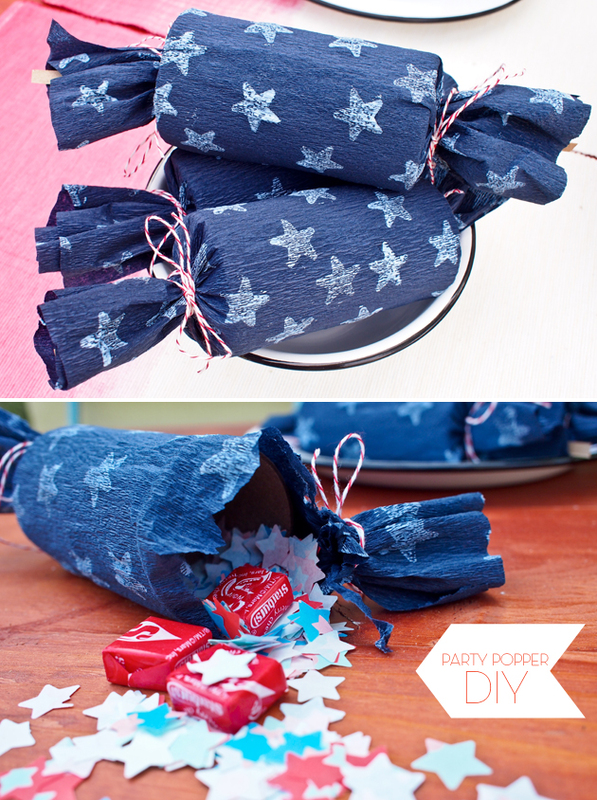 Fine…I’m going the flame-less route with these party crackers and then catching some sparks at the local mall. Girls gotta do, what a girls gotta do…and by do, I suggest you paint a plastic dino and put it in here along with some confetti and sweet treats. One word: BANGIN! Check out all these recipe and DIY ideas plus many more over on HGTV.com ~ WOOP! 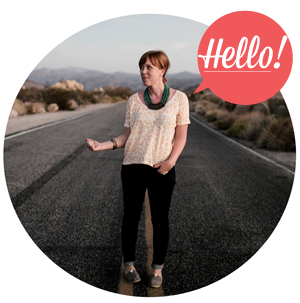 Welp, here’s to making independent choices in good design! Wishing everyone a safe and enjoyable long holiday weekend. My your drinks be cold, your grill on fire and delicious treats a’flowin. Let me know what you’re planing on serving up and if you’re thinking about adding any of these festivities to your table. I always thought it was the coolest freaking thing that you guys can use your own fireworks in the US. Here is Australia, it’s basically unheard of. Spicy corn is a good compromise I guess. Great ideas Kristin! I’m having a big barbecue for the 4th, and I was just wondering how to decorate the back yard without it feeling cheesy. Fun inspiration here. Grill the fruit & grill the veg! I’m trying the grilled watermellon tonight!